Etching is a process by which an artist can create a limited number of nearly identical prints called an EDITION. Each print is numbered and documented to guarantee that no more than the stated number will be pulled. The designation "49/50" means the 49th print in an edition of 50. A plate of zinc (this artist's choice) is cut to the desired shape and size. The plate is covered with a thin layer of acid-resistant stop-out. Then, with a stylus, or hard pencil, the lines are drawn that will be etched, exposing the metal. The plate goes into an acid bath long enough to etch the lines exposed. After the lines are etched the stop-out is cleaned off the plate. 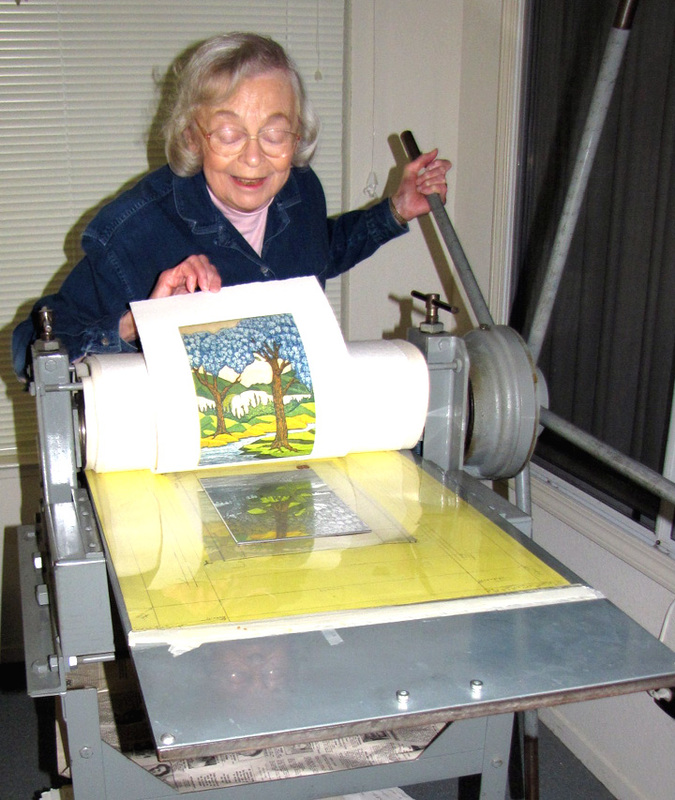 Here the artist's process is continued with an aquatint method to produce areas of tone. Some plates are in the acid as many as 9 or 10 different times to create a full range of values. Etching ink is applied to the entire plate with a dauber. The plate is then wiped with tarlatan using rapid circular motion and light pressure to remove the ink from the surface while leaving it in the etched lines and aquatinted areas. The inked plate is placed on the bed of an etching press. A dampened sheet of 100% rag paper is placed on top of the plate and turned through the press, transferring the reversed image to the paper. The pressure of the press at the edges of the plate creates a "plate mark" or embossed edge.